You don't need to go to Munich to have a great Oktoberfest party! Decorate for your next party with our Oktoberfest decorations! Our Oktoberfest cutouts are a quick and easy decorating solution. Just how simple is it? Well, all you have to do is tape or pin them to your wall for instant flair! Celebrate Germany's largest and oldest festival with our German Flag and Bavarian flag cutouts. Serve up some bratwursts on our new Oktoberfest Paper Trays, or celebrate delicious German cuisine by decorating with our Pretzel Cutouts. Add some personality to your party with our Oktoberfest Fraulein and Mr. Oktoberfritz cutouts. These tall, jointed cutouts are perfect when you need to add a few more guests to your party! Hang them up alongside our other Oktoberfest cutouts for an unforgettable Oktoberfest party. Even if it's not September, you can celebrate Oktoberfest any time of the year with these German party supplies! Decorating For Oktoberfest On A Budget! How do you decorate for an Oktoberfest party without spending a lot of money? 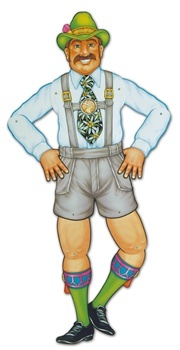 Use Oktoberfest cutouts from right here at PartyCheap! Cutouts have excellent details and are printed with a full range of colorful realistic items like the Beer Stein Cutouts, or they can show an Oktoberfest scene like the Oktoberfest Decorations Cutouts. All of these cutouts are printed on durable cardstock paper that can last year after year with minimal care. Some of our cutouts, like the package of four pretzel cutouts, are ideal for turning into hanging decorations. Add a string or ribbon and you have unique Oktoberfest decorations that you can use nearly anywhere. It wouldn't be an Oktoberfest party without some type of refreshments, particularly those of the alcoholic variety. Place our Beer Hall Sign over a doorway or a refreshments table to add some color. You can also attach our German flag cutout to a stick and make a German flag decoration for your front lawn. No matter what cutouts you choose, they are an inexpensive, fun way to tie all of your party decorations together! Our Oktoberfest Decorating Kit is a great way to get Oktoberfest Cutouts at a very reasonable price. The Kit includes cutouts, banners, art-tissue balls and fans to hang around your party venue.